Ben Duckett is hopeful he and his Northants team-mates can make up for the loss of David Willey next season. Willey will be joining County Championship Division One champions Yorkshire at the conclusion of the current campaign. The departure of the talented 25-year-old will leave a massive void in Northants’ batting and bowling departments. But though he knows Willey will be a massive loss, Duckett, who penned a new two-year contract at the County Ground last month, is hopeful others can step up. “It creates a massive gap in one-day cricket and also Championship for the bowlers and all-rounder slot and it will be big boots to fill, but hopefully we’ll be able to do that,” Duckett said. 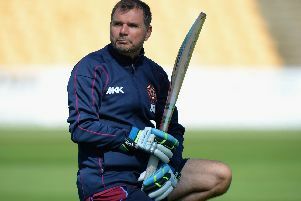 Duckett has been opening the batting for Northants in Championship cricket and has often been at four in the T20 matches. But with Willey, who opens in the 20-over format moving on, the 20-year-old could fancy an elevation. “I’m not really too sure yet where I’d like to be batting in one-day or Championship cricket, but I’ve got up the top of the order and I did alright in that position,” Duckett said. Duckett has flourished in all forms of the game, but particularly relishes the shorter stuff. And he said: “Quite a lot of young players now, if you look into the one-day squad, from 20 to 25, there’s a lot growing up wanting to do all of these skills and all of these shots. “They look at players like Jos Buttler playing scoops and one-day cricket in England is going to be much bigger than it has been in the past few years. And on opening the batting in first-class cricket, in which he has notched five hundreds and nine 50s in just 29 matches, Duckett added: “It’s a role that I didn’t think I was going to be doing, but I was happy to give it a go. “I only got 20-odd in my first game, at Kent, but I cashed in on a pretty flat wicket at Lancashire and it’s been paying off. “I’m not really looking too far ahead. I thought it would only be for a few games as an opener but because it’s gone well I’ll probably keep doing it.